Dr. Amin Jaafari has worked hard to get where he is. As an Arab living in Israel, he had to put up with a lot of racism and work very hard to become a surgeon in Tel Aviv. He has a very long day ahead of him when a suicide bomber blows up a restaurant. Dr. Jaafari performs multiple surgeries and goes home in a daze, ready to collapse from exhaustion. In the middle of the morning, he's called back to the hospital. The police are there, asking him to identify his wife, whom they believe was the suicide bomber. Dr. Jaafari can't believe this until he gets a note in the mail from his wife, dated a few days before the bombing, apologizing. Dr. Jaafari sets on a quest to determine who turned his wife and how he missed the signs, not worrying about any danger he might be putting himself in. This is an interesting subject for a novel, how the loved one of a suicide bomber who doesn't believe in the cause copes with the aftermath. It tears Dr. Jaafari apart and he tries very hard to find meaning in what happened and bring those who were responsible to justice. But the question is whether justice can be found and if there is meaning. There were a few times that this book felt a bit preachy to me, but it got across its point in quite an impactful way. First Line: "I don't remember hearing an explosion." The second book in the Maze Runner series sees Thomas and his buddies in a safe-haven, having just escaped the maze. Thomas wakes up to screaming and Teresa in his head, saying that something is wrong. Then he can't hear Teresa anymore, her voice replaced with screams of Cranks trying to enter the building. The boys run from the windows, into a room filled with bodies of the people that saved them. Going around the bodies to Teresa's room, they instead find a single boy, who was a member of a different maze trial but with girls. Soon, a man appears telling them they are about to embark on the next phase, the scorch trials, where they have to travel 100 miles north. It is said to be even more difficult than the maze trial and the boys can only imagine what that means. I was hoping that this book would answer some of the many questions raised in the first book but felt rather let down in this aspect. Only a few questions were answered, one of them right at the end of the book that didn't allow me the ability to mull it over. Of course, more questions were raised in this book as well. I kind of feel like it was an episode of the tv show Lost. Lost of questions and not many answers. At the same time, I was getting a bit frustrated at the beginning of the book because of how ridiculous it was. But when I look back on The Maze Runner, it was a bit ridiculous as well and it didn't bother me that much so I'm not sure why it did now. I still enjoy the characters though and want to get the answers to my questions so I'll probably continue the series. First Line: "She spoke to him before the world fell apart." Michael Gates Gill had it all: a great job as a director of an ad agency, four kids, a nice house, and a wife. Then his life started to fall apart. He was laid off from his job because he was too old, he had an affair and another child and got divorced where he lost his house too, and he developed a tumor at the base of his brain that impeded his hearing. After 10 years of being a consultant and consistently losing clients, 60-something year old Gill is in a Starbucks when a young lady comes up to him and asks him if he would like a job. On a whim, Gill says yes and starts a new journey in his life working at Starbucks. Gill learns a bunch of lessons while working at Starbucks that he never learned in his previous life as a director and learns to accept his job and eventually love it. He realizes that he didn't spend enough time with his kids or really live in the moment at all in his younger years. This book was endearing at times, although some of the lessons that Gill had to learn would be common sense for most of us. While overall, I did enjoy this because it was rather cute (written by an elderly man it's kind of funny to say that! ), there were a few issues that bothered me. First, Gill mentioned his tumor a few times but there was no resolution on this by the end of the novel. And second, at times the book felt like a big advertisement for Starbucks. Are "Partners" supposed to make conversation with guests while they order and pay for their coffee? This rarely happens to me. The other rather ironic thing here is that Gill speaks about how he is satisfied with his life now as a barista, and yet he goes and writes this book, which I sure gave him a pretty penny! First Line: "This is the true, surprising story of an old white man who was kicked out of the top of the American Establishment, by chance met a young African-American woman from a completely different background, and came to learn what is important in life." Friday is an orca slowly dying at a facility in Columbia due to inadequate food and poor living conditions. The Max L. Beidelman Zoo decides to save him and transport him to their newly created pool at the zoo. The whole team is worried that Friday may not survive the trip but he does and then the real work begins. Executive director of the zoo Truman hires a marine mammal rehabilitator Gabriel to slowly help Friday become a healthy whale. Truman's girlfriend Neva and aunt Ivy also help with training and the financials. There's also animal communicator Libertine who hears Friday when he first moves to the zoo and comes to see if he needs help or wants to communicate more. This story is a heart-warming story of how people come together to help a mammal in need. 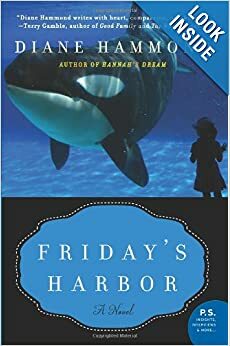 It also gives great insight in to how the rehabilitation program works with whales and what their personalities are like. Friday is just as much a character in this book as any of the people. It's impossible not to smile while reading about how Friday would float at the windows staring at kids coming to watch him at the zoo because he is just as fascinated with them as they are with him. This book also addresses the more serious issue of freedom versus captivity for animals. Many different opinions are presented. I was interested in hearing how the rehabilitators aren't sure that an animal in captivity for so long could survive in the wild without the assistance of humans. It is a good point and you wonder if it would actually be cruel to let animals raised in captivity back to the wild because they couldn't even feed themselves. I really enjoyed this book and would go back to pick up the first in the series, Hannah's Dream. This was a nice, light read. Thank you to TLC Book Tours for letting me be a part of the book tour. First Line: "In Bogota, Columbia, a twenty-one-foot-long, nineteen-year-old, North Atlantic-caught killer whale swam around and around." This is the fourth book in the Outlander series, where Jaime and Claire are now in the USA and settling down their homestead. They meet Jaime's aunt who owns a plantation. Claire has to wrestle with the fact that she also owns slaves. Something has been left in the future though, which is Jaime and Claire's daughter Brianna. When Brianna finds a notice stating that her parents will die in a fire at their home, she is determined to go to the past to try and save them. When her boyfriend, Roger, finds out she's gone he isn't impressed and follows her through the stones. Typical to all the books in this series, this is another thousand page novel. Unlike the previous three books, however, I felt that this moved very slowly. The previous books had as much historical fiction as it did romance but this book seemed to be more romance than anything else and it bored me. There was also repetition in the story. Jaime gets lost in the woods, then shortly after Claire gets lost in the woods. Couldn't another story have been thought up? A new element to this book was the introduction of the Native Americans. It added interesting new characters and situations to the book, but not enough to save it. Given how much I felt this book was a bit of a waste of time, I'm not sure how I feel about continuing on with the series because they are such time investments. First Line: "I heard the drums long before they came in to sight." Henry Oates is pulled over for driving suspiciously when the police find a body of a young woman in the back of his car. He's brought in to the station where he is questioned and admits to two additional murders. DCI Mike Lewis takes over the investigation, though when DCS Langton learns that one of the suspected victims is a young girl that he investigated the disappearance of, he also assigns DCI Anna Travis to the case. Oates recants his admission, stating it was just a joke to get their attention. Lewis and Travis start digging through the files to figure out if they can trap Oates in a lie and determined what really happened to the missing girls. This is the 8th or so book in the series and I found that this book doesn't entirely stand on its own. I was missing a lot of back story on Langton and Travis to help me figure out what kind of people they really were. Langton seemed angry all the time. I couldn't understand what Travis could see in him or why she would continue to put up with his demands. At the same time, Travis seemed to have no personality. I think the previous seven books would have helped ease me in to the characters because from just this book, I liked DCI Mike Lewis the best and he wasn't even a main character. This could also be the reason why I felt like the ending was forced in the exchange between Travis and Langton, because I don't know enough about the characters to understand why that happened. This book isn't the usual who-done-it that you get with mysteries as there has already been an admission of guilt. I found myself waiting for the other shoe to drop and a big twist to be revealed. There were twists but they all came at the end of the book rather than spaced out to keep you anticipating what would happen next. Overall, I think this book suffered from not explaining the characters well enough to new readers to the series, and lack of excitement through the majority of the book. Thanks to TLC Book Tours for letting me be part of this tour. First Line: "Quite night so far, isn't it?" The third and final book in the Divergent series has Tris and Tobias' world crumbling apart. The factionless and Tobias' mom have taken hold of the city but some folks aren't too happy that factions have been banished. Tension starts to grow between these two groups and Tris and Tobias decide they must leave the city. Once they leave, they learn all about the purpose of the city and Tris even learns more about her mom. However there is tension here too and it seems that these two worlds are set to collide. This book felt a bit forced, like Roth was trying to come up with enough content for the third book. There were also some consistency issues. Tris and Tobias should not have know about the existence of some items outside of their city but they didn't seem to question everything they should have. There was also a big spoiler given in the way this book was written. The past two books were written only in Tris' view. This one is in both Tris and Tobias' view, from which I made some conclusions pretty early in the book that were accurate. This was not the best way to end the series, but overall the book was ok.